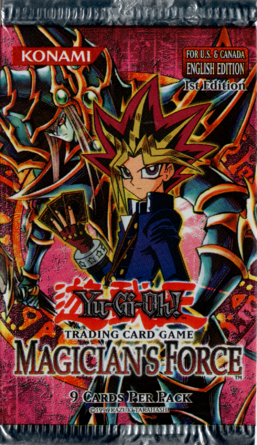 Magician's Force is a Booster Pack, which combines the Japanese sets Advent of Union and Champion of Black Magic. It has been printed in the Yu-Gi-Oh! Trading Card Game in English and in the Yu-Gi-Oh! Official Card Game in Asian-English and Korean. It contains a new set of cards called Union Monsters, with the ability to combine and strengthen other monsters, along with plenty of Spellcaster-Type monsters and support cards. It contains the "Amazoness" archetype and introduces the Spell Counter mechanic in which certain cards could only be played by removing a number of "spell counters" which are usually acquired by playing Spell cards. Highly sought after cards include "Dark Magician Girl", "Breaker the Magical Warrior", "Tribe-Infecting Virus", "Magical Scientist" and "Chaos Command Magician". This is the first set to fully use the term "Spell Card", after the rename from "Magic Card", despite later prints of Pharaonic Guardian doing such. In the English and Asian-English versions of this set, each pack contains 9 cards and each box contains 24 packs. In the Korean version, there are 5 cards per pack.